Val is a 6 foot tall, 300 pound humanoid robot made by NASA. We received it as part of a collaboration with Northeastern University and she lives at the NERVE Center. Valkyrie has a total of 44 degrees of freedom throughout all of her limbs and has a spinning LIDAR and stereo cameras for sensing her environment. Both Things use one of the arms from a Rethink Robotics Baxter system. Thing 1 is the arm mounted on a cart that is intended to be used while next to a wheelchair (left). Thing 2 is attached to a powered scooter (right). 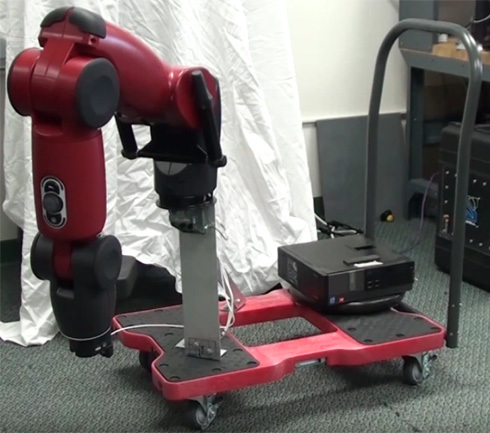 Baxter is a robot for manufacturing from Rethink Robotics. 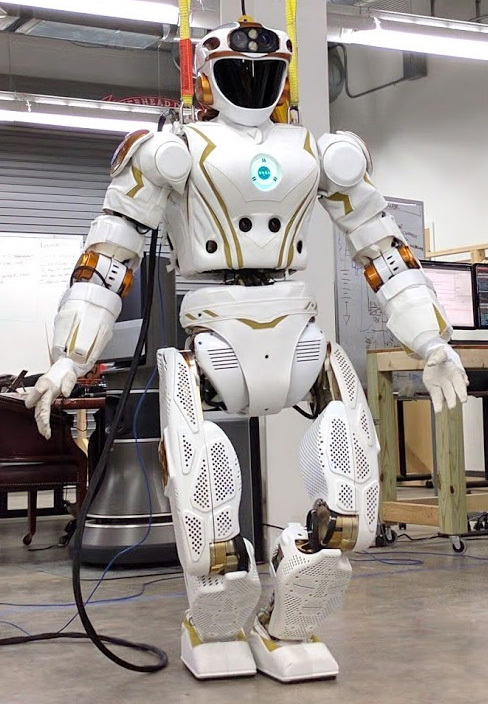 He is a humanoid robot with two 7-axis arms, integrated cameras, sonar, torque sensors, and direct programming access via a standard ROS interface. 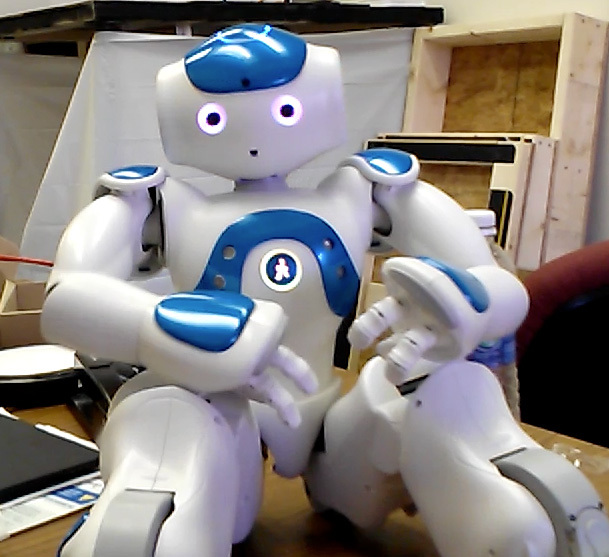 Blue is a small humanoid NAO robot made by SoftBank Robotics (previously Aldebaran), with 25 degrees of freedom, cameras, IMU, microphones, and speakers. 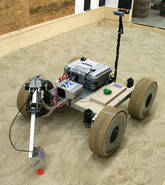 The Rover Hawk is the winner of the 2013 NASA RASC-AL Robo-Ops Competition, build by a team of undergraduates from a Robotics I class led by three graduate students. The Rover Hawk is powered by a Mini-ITX with a quad core i7, 16GB RAM, and Samsung 840 Pro SSD. 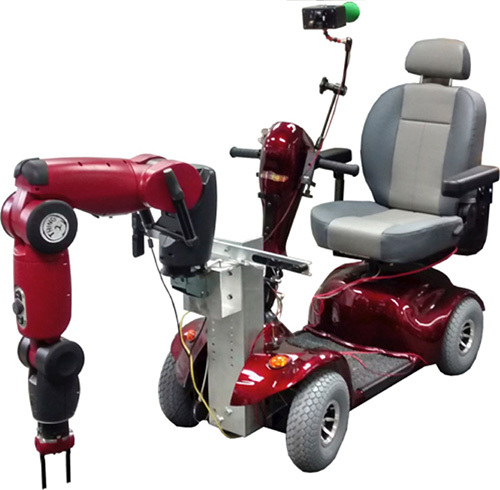 A MiniBox is used for voltage regulation from 12v batteries, two Roboteq MDC2230C motor controllers, three 12v mil-spec Lithium Ion batteries, 4 windshield washer motors to control the wheels, and 4 American digital optical encoders, in custom aluminum motor mounts. 3 Logitech HD cameras, 2 on the fiberglass mast (actuated by a 2 ft-lb robotics servo), and one on the arm (able to see through the gripper). 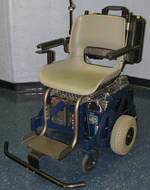 The arm and gripper are custom made from aluminum, designed in SolidWorks. 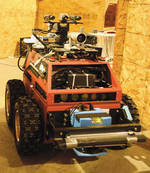 Click here to see a video of the Rover Hawk in action. 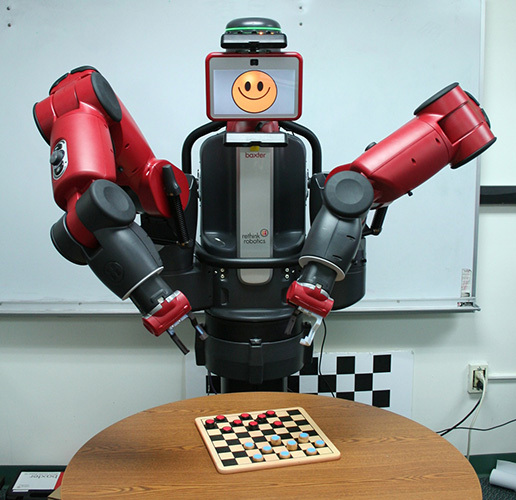 Junior is an ATRV-Jr research platform that was manufactured by i-Robot. We use Junior in our Urban Search and Rescue interface research. We have made the following hardware and software modifications to Junior: Front and Back Canon VC-C4 PTZ Cameras, Carbon Dioxide Sensor, Software control of 12 Volt devices, 4-port Simultaneous Framegrabber, FLIR Thermal Imager, 802.11a/g Wireless, Intel Core 2 Duo with 4GB of DDR2 RAM, and Linux Kernel 2.6.1. 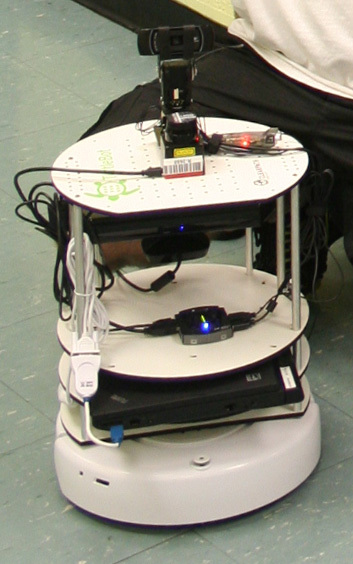 The TurtleBot uses a Kobuki Base and is powered but a Netbook running ROS. It uses an Asus Xion Pro Live and Kinect. The Manus Assistive Robotic Manipulator (ARM) is a commercially available wheelchair mounted robot arm developed by Exact Dynamics. It was designed to assist with general activities of daily living and can function in unstructured environments. The Manus ARM is a 6+2 degree of freedom arm that can be controlled in both joint and Cartesian space by a keypad, joystick, single switch, or computer. Lancelot is a modified Quantum 6000 wheelchair, with it's commands being overwritten with a Lenovo x230 laptop. It has additional IMU and two laser range finder sensors. 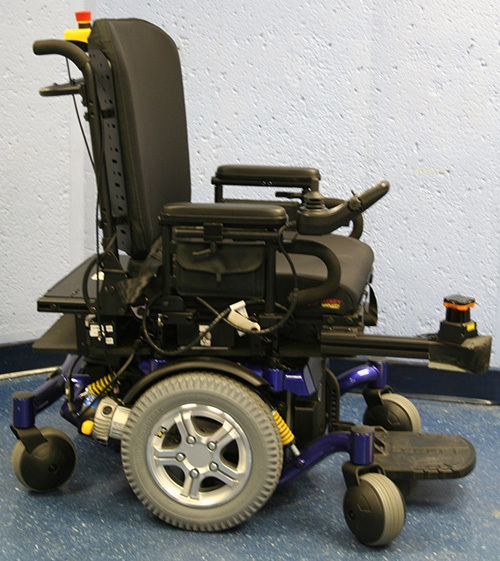 Previously named Wheelesley, Wheeley is a power wheelchair that was originally used by Holly Yanco during her PhD. research. We replaced the original Motorola 68332 with a full Pentium 4 2.8Ghz Mini-ITX PC. We also upgraded the motor control to a RobotEQ AX2850 with high resolution optical encoders. 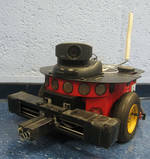 Tragus is a VGTV (Variable Geometry Tracked Vehicle) and is a tele-operated, tethered robot. It is capable of changing its shape, depth rated to 100 feet, and equipped with a color zoom camera, two-way audio, and lights. Sensors and small equipment can be carried by Tragus into search areas. 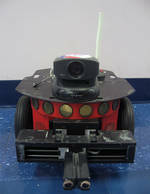 Morpheus is a Pioneer 3 robot which was manufactured by MobileRobots (formally ActivMedia). He is a standard Pentium 3 Linux box with a full sonar ring, SICK laser, and a Canon VC-C4 PTZ camera. He is currently being used for studying levels of autonomy. Trinity is a Pioneer 2 robot. She is very similar to Morpheus. 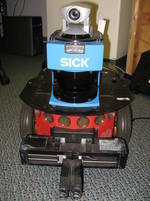 We primarily use her for the graduate Mobile Robotics class and the undergraduate Robotics 2 class. Neo is a Pioneer 3 robot, also manufactured by MobileRobots and similar to Morpheus. He is a standard Pentium 3 Linux box with a full sonar ring and a Canon VC-C4 PTZ camera. He was used in the Mobile Robotics class.